Nora P. Wolfson, the inventor of the original fudge sauce recipe, came to Miami from Omaha and married a Key West entrepreneur in the early 1920’s. She delighted in dreaming up wonderful desserts. When she sold the sauce and cookies in the 1940’s and 1950’s to hotels like the Fontainebleau in Miami Beach, an ad stated: “Flavor at its finest…unbelievably rich Fudge Sauce with its intriguing bitter tang to delight epicurean palettes.” There are even stories about a Miami politician who kept the cookies in a safe in his office. Nora Wolfson, together with her grandson Scott Levin and the entire family, reintroduce Maison de Nora fudge sauce to the market. Within 19 months the sauce has spread into 40 states and the family business has over 500 national accounts. Stories about Nora Wolfson and her grandson, Scott Levin, are featured in People and Vogue, the New York magazine, New Woman, Tampa Tribune, The National Enquirer, Travel and Leisure, The Miami Herald, St Petersburg Times, Sarasota Herald Tribune, Sarasota Journal, Bon Appetit, and a plug on ABC’s “Good Morning America”. 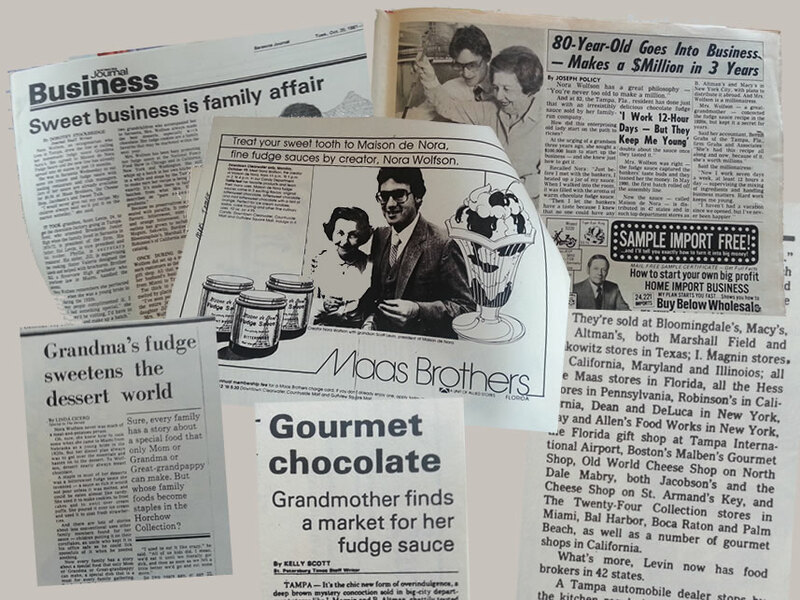 Maison De Nora fudge sauce is sold at Bloomingdale’s, Macy’s, B. Altman’s, both Marshall Field and Sakowitz stores in Texas; I. Magnin stores in California, Maryland, and Illinois; all the Maas stores in Florida, all the Hess stores in Pennsylvania, Robinson’s in California, Dean and DeLuca in New York, Fay and Allen’s Food Works in New York, the Florida gift shop at Tampa International Airport, Boston’s Malben’s Gourmet Shop, Old World Cheese Shop, and The Twenty-Four Collection stores in Miami, Bar Harbor, Boca Raton and Palm Beach, as well as a number of Gourmet shops in California. Jill Levin Stilton, granddaughter of the recipe’s creator, Nora Wolfson, and her husband, the artist Peter Stilton, decide to bring the famous fudge sauce back for people to enjoy. Until now, the secret family recipe was only available to a few friends of the Stiltons.